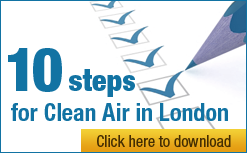 The government has written to the Campaign for Clean Air in London (CCAL), just days before the Environmental Audit Committee (EAC) meets next Tuesday to take evidence as part of its inquiry into air quality, to say ‘there has not been a cover-up’ over air quality premature deaths. CCAL has published the government’s letter on its website with this Campaign Update. The EAC has announced today it will take evidence from King’s College London and others. “We must welcome the government setting out, at last, its reasons for not updating estimates of premature deaths due to dangerous airborne particles since 1998. Justification is needed since the government has known since 2001 the health effects of long-term exposure are ‘considerably greater’ than the effects of short-term exposure that were quantified in 1998. “In CCAL’s view, two points are particularly indefensible. First, the government’s persistent refusal to acknowledge the importance of premature deaths (aka ‘attributable’ or ‘brought forward’ deaths) as a key metric in communicating the health impact of dangerous airborne particles to the public. Its stance contrasts sharply, for example, with that of the European Environment Agency, the European Commission, the United States’ Environment Protection Agency and the World Health Organisation (WHO). Second, the government’s slowness in updating crucial air quality statistics. “The government’s complacency is indefensible when 3,460 and up to 7,900 people are estimated by CCAL to have died prematurely due to dangerous airborne particles in London in 2005 alone. They may have died 9.8 years early on average. Further details of CCAL’s investigation are shown in the Appendix that follows. CCAL considers that much of the government’s reasoning in its letter to CCAL dated 1 February 2010 is flawed and intended to justify its failure to update, or its ‘covering-up’ of, over 250,000 premature deaths due to dangerous airborne particles over 10 years. Dangerous airborne particles (or particulate matter) are usually defined in terms of size i.e. PM2.5 (up to 2.5 microns (μm) in diameter) (fine particulate matter) and PM10 (up to 10 μm in diameter). Concentrations of PM10 in Europe typically comprise around 65% to 75% PM2.5. There are four key metrics to describe the health impact of poor air quality: premature (or attributable or brought forward) deaths; years lost per statistical victim; total years of life lost (YOLL); and average reduction in life expectancy. Of these metrics, the government says: “The complex nature of the change in the pattern of deaths over time, and the fact that, in the long-term, everyone will die, leads us to prefer total life years and average gain or loss of life-expectancy as the appropriate metric”. CCAL considers the government’s stance indefensible when contrasted with international practice. Why do we know the picture for Europe as a whole (and their view of the situation in the UK) and not the UK’s view? CCAL deals with each metric in turn below. The European Commission (EC), European Environment Agency (EEA), World Health Organisation (WHO) and the United States’ Environmental Protection Agency (EPA) have all published in recent years estimates of the number of premature deaths due to PM2.5. This stated: “Air pollution in the EU, notably from fine particulate matter and ground-level ozone, presently causes the premature death of almost 370,000 citizens every year and reduces average life expectancy by an average of 9 months. In the most polluted areas, the loss of life expectancy may be up to two years. Altogether, air pollution robs Europe’s population of 3.6 million years of life annually, as well as causing increased hospital admissions and medical costs. The human health damage that air pollution causes is estimated to cost the European economy between €427 and 790 billion per year”. Page 5 of the report says: “The number of premature deaths per million inhabitants attributable to PM10 exposure (the EU-27 as a whole) was estimated to range from 510 to 1,150 cases per million, with a best estimate of 830 deaths per million (median). The observed range is mainly a result of the differences in PM10 concentrations over Europe, and partly of the differences in age distributions and baseline mortalities. Measured particulate matter (PM) concentrations in Europe have not shown, in general, any downward tendencies over the period from 2000 to 2005. The number of 830 premature deaths per million inhabitants corresponds to about 373,000 premature deaths in the EU-25 countries in 2005. This estimate agrees well with the results of the CAFE Programme where 348,000 premature deaths caused by (only) anthropogenic primary PM and PM precursors emissions were estimated for the year 2000”. Figure 3.4 on page 20 shows the UK as having around 650 premature deaths per million (aged 30 and over) due to PM10 in 2005. This equates to 2,905 in London alone (assuming PM10 comprises 70% PM2.5 and London has UK average exposure to PM2.5). The government says the coarse fraction of dangerous airborne particles (i.e. PM2.5-10) contains no significant health risk. The Table on page 3 ‘Estimated change in health damage due to PM in the EU through implementation of current legislation, 2000–2020’ as: Mortality due to long- term exposure as being 288,000 premature deaths and 3,001,000 life years lost in 2000 and 208,000 and 1,900,000 respectively in 2020. This estimated that the benefits of the new regulations would include a reduction in 1,200 to 13,000 premature deaths in people with heart or lung disease (Note: This range includes estimates based on the opinions of outside experts, along with published scientific studies). In CCAL’s view, the regular publication of estimates of premature deaths for Europe as whole due to particulate matter (PM2.5 and/or PM10), with some defining the impact for the UK also, makes the government’s position indefensible in failing to publish such metrics. Further, the fact that the EC, EEA and WHO all include YOLL and premature deaths makes the government’s position even more indefensible. The government says “The complex nature of the change in the pattern of deaths over time, and the fact that, in the long-term, everyone will die, leads us to prefer total life years [i.e. YOLL] and average gain or loss of life-expectancy as the appropriate metric”. In CCAL’s view, however, years lost per statistical victim – particularly when combined with a number or probability of premature death(s) – is more meaningful to someone weighing risk than an average reduction in life expectancy or total YOLL across an entire 61 million person population. The government goes into a long explanation as to why it favours YOLL as one of two main metrics for describing the health impact of long term exposure to PM2.5. In essence, all government is saying (and this is clear too from conversations CCAL has had in recent months with Department of Health officials) is that the number of premature deaths due to PM2.5 needs to be calculated for each year. The government is concerned that people may interpret such a number as an annual – ongoing – number even though concentrations of PM2.5 are expected (by the government) to reduce in subsequent years. CCAL finds this logic unacceptable since it presumes the information is not important to people and that we will fail to understand necessary caveats. Further, CCAL is deeply concerned, given levels of PM have not reduced noticeably since 2000 and government modelling forecasting reductions in pollution has been completely wrong, that YOLL ‘bar charts’ need to show the population weighted average exposure they are assuming over time. Otherwise, the assumptions behind YOLL will be opaque or worse. The government says “The complex nature of the change in the pattern of deaths over time, and the fact that, in the long-term, everyone will die, leads us to prefer total life years and average gain or loss of life-expectancy as the appropriate metric”. The government says: “We do believe that the general public understands the concept of life-expectancy reasonably well” and “Updated estimates on the impact of exposure to air pollution were published in the Air Quality Strategy 2007 for England, Scotland, Wales and Northern Ireland (AQS 2007). Average loss in life expectancy figures (a reduction of 7-8 months) and total life years lost were used to express the impact of long- term exposure to particles”. CCAL agrees that people understand the concept of life-expectancy reasonably well. However, the government then chooses to present the information in the most meaningless manner. For example, in the AQS 2007 referred to above, the Minister says in the Foreword: “Air pollution is currently estimated to reduce the life expectancy of every person in the UK by an average of 7-8 months with estimated equivalent health costs of up to £20 billion each year”. In CCAL’s view, wording gives the impression that every single one of 61 million people in the UK faces the prospect of a reduced life expectancy due to air pollution. First, this is clearly not the case for those living in clean air and second, as we have seen earlier the 7-8 months range is much less than the life years lost per statistical victim. In CCAL’s view therefore, the government – having dismissed the more meaningful metrics – makes meaningless the last remaining metric by providing an average across the entire population. In CCAL’s view, the government’s stance is indefensible. The government’s reply to CCAL says ‘It was noted that the health impact of long-term exposure were considerably greater than the short-term effects’. In CCAL’s view, this phrase understates the quantum of risk which was identified by COMEAP in 2001 as being some ‘10 fold’ greater. Further, in CCAL’s view, it is indefensible for the government still to be referring to premature deaths calculated in 1998, based on 1995 and 1996 air pollution levels, when these relate only to short-term exposure for which the health impact is much less than long-term exposure. The chronology of knowledge is set out below. The same COMEAP report referred to 3,500 deaths brought forward per year due by sulphur dioxide (SO2) in urban areas of GB and between 700 and 12,500 deaths brought forward by ozone (O3) in both urban and rural GB during the summer only. Ministers, commentators and others have therefore estimated and referred, including as recently as late 2009, to there being 12,300 and 24,100 deaths ‘brought forward’ (or ‘up to 24,000 deaths’) annually in the UK due to air pollution. Subsequent scientific studies, most notably in the United States (with greatest weight being placed on the American Cancer Society (ACS) and Harvard Six Cities studies), followed ‘cohorts’ of individuals over long periods to assess health impacts. CCAL understands these added cardiovascular and cardiopulmonary risks to the respiratory and cancer risks expected from short term exposure to air pollution. PM2.5 was seen as a greater risk than PM10. In March 2001, COMEAP reported on the health impact of long-term exposure to PM2.5 in “Statement and Report on Long-Term Effects of Particles on Mortality” based on an analysis of cohort studies. COMEAP proposed a hazard rate (or risk coefficient) for long- term exposures of 0.1% per 1 μg/m3 drop in annual mean PM2.5 for those aged 30 years and over (i.e. 1.0% per 10 μg/m3). The government did not quantify the number of premature deaths due to PM2.5 but CCAL estimates this coefficient means a decrease in deaths of 100 people in a city or town of 10,000 total deaths in a year among those aged 30 and over for every 10 μg/m3 drop in PM2.5. In 2009, COMEAP updated its estimates of the health impact of long-term exposure to PM2.5. This concluded, again from cohort studies, that the best estimate for all cause mortality due to long term exposure to PM2.5 is a 6.0% increase in mortality of those aged 30 and over for a 10 μg/m3 increase in PM2.5 (i.e. as a measure of premature deaths). The government again did not quantify the number of premature deaths due to PM2.5 but CCAL estimates there were 3,460 premature deaths due to PM2.5 in London in 2005 using this coefficient. COMEAP’s 2009 report suggested a plausible range of 1% to 12% could be used in sensitivity analysis. It recommended that the wider range of 0 to 15% be included in any report on quantification of risks from long-term exposure to PM2.5. CCAL estimates there were 6,500 or 7,900 premature deaths due to PM2.5 in London in 2005 using the 12% and 15% coefficient respectively. These higher coefficients are not ‘wild’ numbers. Follow-up to the Harvard Six Cities study shows that an overall reduction in PM2.5 levels results in reduced long-term mortality risk. Both this study and the analysis of the ACS cohort data in Los Angeles suggest that previous studies may have underestimated the magnitude of mortality risks. These studies, published after COMEAP set a cut-off of early 2006 to the consideration of research for its 2009 report, suggested average coefficients of 16% and 17% respectively per 10 μg/m3 increase in PM2.5 i.e. compared to the UK’s 6%. CCAL welcomes the government setting out, at last, its reasons for not updating estimates of premature deaths since 1998 (which anyway were due to short-term exposure to dangerous airborne particles (PM10) based on 1995 and 1996 air pollution levels). CCAL welcomes also the government confirming that “Calculations of the total health impact of the long-term exposure to fine particles (PM2.5) will be done as part of a forthcoming supplement to [COMEAP’s 2009] report. This will include a consideration of the different metrics that can be used to express the health effects”. However, CCAL finds it indefensible that the government should be taking over 10 years to update such crucial air quality statistics and giving no assurance that it will comply fully with international best practice in this area. The government says “We do not generally support the use of coefficients from cohort studies (which examine effects of long-term exposure) in calculating numbers of deaths. In the UK, the estimated health impact of long-term exposure to fine particulate air pollution is expressed in terms of ‘loss of life expectancy’”. The government confuses its message by saying (presumably in relation to time series) “In the UK, calculations of the numbers of deaths affected per year by exposure to PM10, SO2 or O3 is expressed in terms of ‘deaths brought forward’”. In other words, cohort studies are better than time series studies for estimating the number of premature deaths per year. Further, the government’s letter to CCAL admits that Years of Life Lost (YOLL) is a number derived thereafter. The government says “Therefore, any comparison with alcoholism, obesity and smoking would be most appropriate on the basis of total life-years lost or average loss of life- expectancy. It also worth noting that some of the deaths due to alcoholism and obesity can be clinically identified. The relevant contributing disease can be listed as an underlying cause of death by ONS. This is not possible for deaths where air pollution is a contributing cause”. Again, CCAL considers the government’s stance indefensible.